Club 20, billed as the “Voice of the Western Slope,” held its fall political debates Saturday in Grand Junction and, while numerous candidates vigorously debated and cross-examined their opponents, the hotly contested race for Colorado’s 3rd Congressional District seat proved the most contentious showdown. “You asked me a question, let me answer! Those are the rules,” Mitsch Bush fired back at Tipton during one of their numerous heated exchanges. 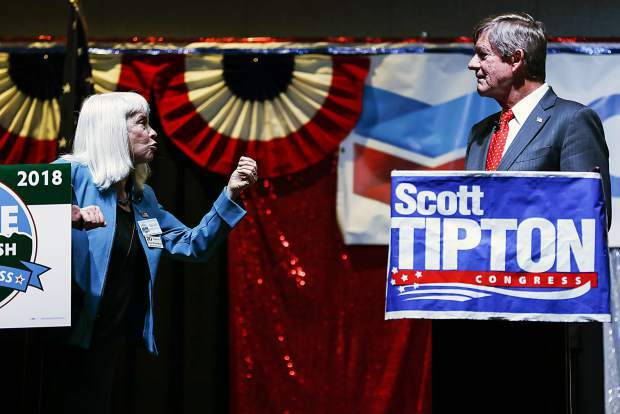 Tipton did not waste any time comparing his opponent to Democratic U.S. Sen. Elizabeth Warren and independent Sen. Bernie Sanders. Mitsch Bush, however, quickly pushed back at Tipton’s socialist portrayal of her candidacy and told the audience that she would promote bipartisanship and not fall victim to big donors, but rather serve her constituents. Although Club 20 often gets labeled as right-leaning, this year’s fall conference and debates, audience-wise, arguably leaned left. Tipton had his faithful base in attendance, but Mitsch Bush fans definitely purchased their fair share of tickets. However, once their candidate left the stage, they too left Grand Junction’s Two Rivers Convention Center, resulting in a sparse crowd for Stapleton’s Q&A session. Polis opted out of participating in the Club 20 debate, and told the Glenwood Springs Post Independent in a recent interview that he instead chose to schedule the Oct. 6 debate sponsored by the Grand Junction Daily Sentinel and Colorado Mesa University, because it’s a free event as opposed to Club 20’s paid admission format. Although the club made up of Western Slope governments and business interests has historically charged, with a marquee sponsor in Chevron, many Mitsch Bush fans laughed when Club 20 Executive Director Christian Reece said ahead of the Stapleton Q&A that organizers still had no idea why Rep. Polis declined their invitation. Republicans, Democrats and independents alike certainly got their money’s worth during the debate for the open Colorado Attorney General seat between Republican George Brauchler and Democrat Phil Weiser. Lively, bipartisan and anything but mean-spirited, the two candidates discussed contentious topics like Roe v. Wade and LGBTQ rights with civility and respect for each other’s beliefs. A rare sight, which clearly resonated with just about everyone in the debate auditorium: those wearing Mitsch Bush T-shirts and others sporting Tipton flair even came together and agreed, saying it was the best debate of the evening.